For the Town of Huntington, see Huntington, New York. The historic former Huntington Sewing & Trade School, now the headquarters of the Huntington Historical Society. Huntington is a hamlet located in the Town of Huntington in Suffolk County, New York, United States. The Census Bureau has also defined a census-designated place (CDP) with the same name that corresponds to the most densely populated area, however local understanding of the hamlet may differ somewhat from the census definition. 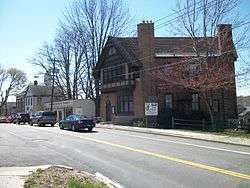 The aggregate demographic and geographic data for the hamlet is also included in the data for the Town of Huntington. The population was 18,406 at the 2010 census. The central business district, called Huntington Village locally, is old and well developed, but it is not incorporated and does not have a village form of government. 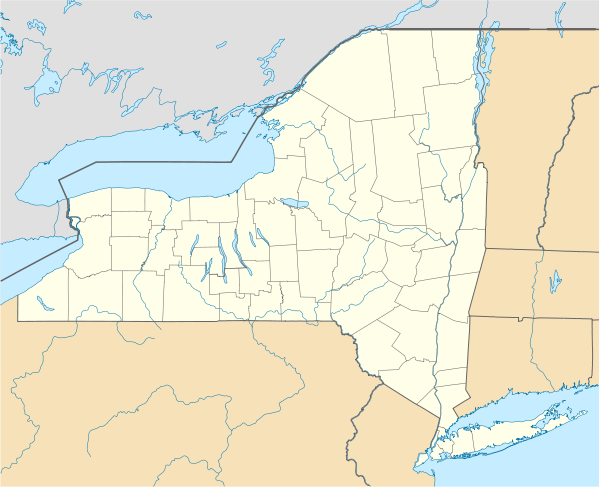 The hamlet of Huntington is located 37 miles (59 km) northeast of Midtown Manhattan. Huntington is located at 40°52′40″N 73°24′49″W﻿ / ﻿40.87778°N 73.41361°W﻿ / 40.87778; -73.41361 (40.877798, -73.413687). According to the United States Census Bureau, the CDP has a total area of 7.7 square miles (19.9 km²), of which, 7.5 square miles (19.5 km²) of it is land and 0.1 square miles (0.4 km²) of it (1.82%) is water. As of the census of 2000, there were 18,403 people, 7,052 households, and 4,992 families residing in the CDP. The population density was 2,442.5 per square mile (943.6/km²). There were 7,273 housing units at an average density of 965.3/sq mi (372.9/km²). The racial makeup of the CDP was 93.71% White, 2.09% Black or African American, 0.11% Native American, 1.80% Asian, 0.01% Pacific Islander, 1.14% from other races, and 1.13% from two or more races. Hispanic or Latino of any race were 3.58% of the population. There were 7,052 households out of which 31.7% had children under the age of 18 living with them, 60.7% were married couples living together, 7.2% had a female householder with no husband present, and 29.2% were non-families. 23.4% of all households were made up of individuals and 8.8% had someone living alone who was 65 years of age or older. The average household size was 2.59 and the average family size was 3.08. In the CDP the population was spread out with 23.1% under the age of 18, 4.9% from 18 to 24, 31.6% from 25 to 44, 26.2% from 45 to 64, and 14.1% who were 65 years of age or older. The median age was 40 years. For every 100 females there were 94.6 males. For every 100 females age 18 and over, there were 91.8 males. The median income for a household in the CDP was $82,934, and the median income for a family was $100,494. Males had a median income of $71,164 versus $45,027 for females. The per capita income for the CDP was $42,960. About 1.9% of families and 3.8% of the population were below the poverty line, including 3.2% of those under age 18 and 6.3% of those age 65 or over. Huntington is the birthplace of American poets Walt Whitman and Jupiter Hammon, aerospace pioneer Leroy Grumman, singer Mariah Carey, and actor Ralph Macchio. Other public figures who have resided in Huntington include: Fiorello La Guardia, Leon Friedman, Otto Kahn, William K. Vanderbilt III, Sergei Rachmaninoff, George Plimpton, Jackie Gleason, Billy Joel, Antoine de St Exupery, Arthur Dove, George Grosz. ↑ "American FactFinder". United States Census Bureau. Archived from the original on September 11, 2013. Retrieved 2008-01-31. Wikimedia Commons has media related to Huntington, New York.